The Masters in Advanced Facilitation Skills for Promoting Health and Well Being offers participants a unique opportunity to finely tune their facilitation and personal skills through practical experience, group process and advanced personal development. For further information click here. This week at the Annual Healthy Ireland Network, the Minister for Health Promotion, Ms Catherine Byrne TD, launched the new Healthy Meeting Guidelines. These guidelines are such as useful and timely resource since meetings are a regular part of many people’s working lives and often involve sitting for a long time with few opportunities to be active. The guidelines offer practical suggestions for healthy food options and for including opportunities for physical activity. In addition, Ashling Jennings who is a member of the AHPI and IUHPE Registered Health Promotion Practitioner was involved in the development of the guidelines. Ashling’s research, as part of her MA in Health Promotion in NUI Galway, contributed to the development of these Healthy Meeting Guidelines. AHPI welcomes the introduction of the levy on sugar sweetened drinks. AHPI welcomes the introduction of the tax on sugar sweetened drinks, which comes into force in Ireland today. AHPI has lobbied for this tax, which is one of a range of measures and interventions which will be required to reduce obesity in Ireland. Sugar sweetened drinks are readily available and high in calories. They are strongly associated with weight gain and are heavily marketed, especially to children. The introduction of this tax is already having a positive effect as some manufacturers have started to reformulate their drinks by reducing the amount of added sugar levels in them. AHPI is the professional body for Health Promotion practitioners. Our website is www.ahpi.ie. 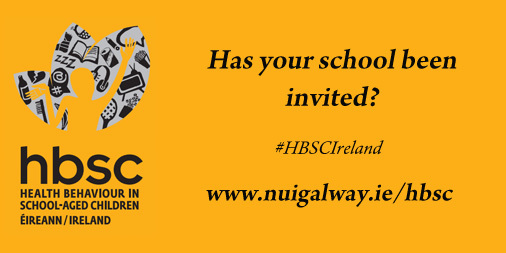 HBSC Has your school been invited? Celebrating 20 years of HBSC data in Ireland, the Health Promotion Research Centre, NUI Galway is now collecting data for the 6th HBSC survey in Ireland! Find out more at www.nuigalway.ie/hbsc"
NUIG are also hosting an opening evening on Friday 13th April at 6pm in room 120 Aras Moyola, NUI Galway. Prospective students can meet with and talk to the lecturers on the courses. AHPI Pre-Budget Submission on the Taxation of Roll Your Own Tobacco.